Denmark's biggest electric bike project has got car commuters choosing two wheels over four, leading to less CO2, fewer sick days and more road space. 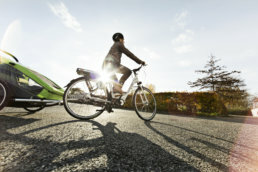 In 2014, eight municipalities and eight hospitals in the Capital Region of Denmark launched the “Test an Electric Bicycle” project. The project gave people commuting over five kilometers to work or school the option to replace their car with an electric bike for three months. The electric bicycles were purchased and lent out by the municipalities and hospitals to employees and citizens, in exchange for a commitment to cycling at least three days a week. A total of 1,681 people participated in the project. Together, they biked more than 884,000 kilometers. This corresponds to an average of 526 kilometers per commuter, reducing their carbon footprint by 91.5 kilos – just by replacing their car with an electric bicycle. The project has a number of positive effects on test participants’ health and has resulted in lasting changes to transport habits. One year after the test period, more than one third continue to cycle for a minimum of three days a week; together, they bike almost 2,000,000 kilometers a year. With relatively close partnerships and simple methods, “Test an Electric Bicycle” is an example of how to achieve CO2 savings, promote citizens’ health and reduce the impacts and environmental problems of increased road congestion. By cycling 30 minutes on an electric bike each day, you achieve the necessary recommended exercise to avoid lifestyle diseases and reduce your number of sick days. "Try an Electric Bicycle" has moved commuters off the roads. During the test period, the project reduced car commuting by 884,000 kilometers. The campaign has created strong results for public partner synergy across municipalities and the region's hospitals through exchanging experience and knowledge.